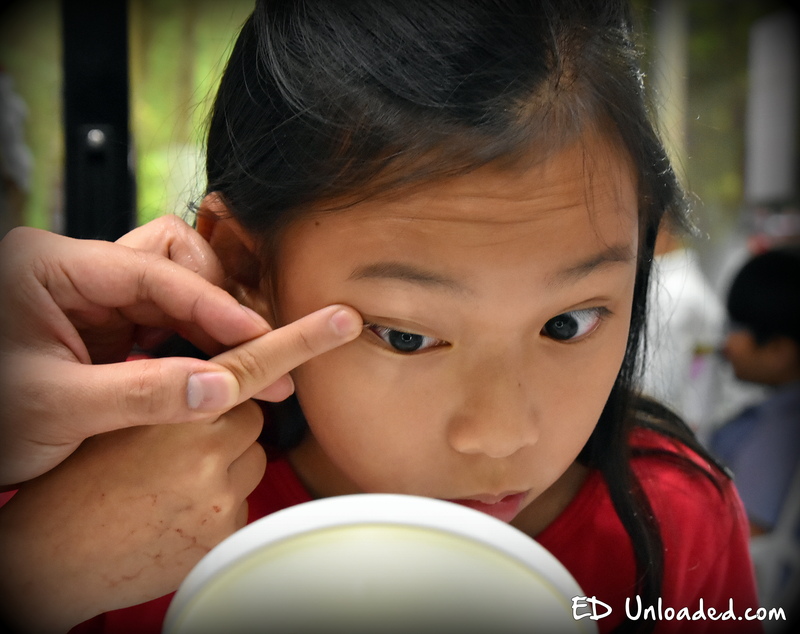 Introducing Orthokeratology (also known as Ortho-K), a non-surgical procedure, where kids or adults can live a life without a need to wear spectacles. For those of us who are afraid of Lasik, where a flap of the cornea is cut with laser technology, Ortho-K is the safe alternative for all victims of myopia. Wearing a special hard contact lens at night, wearers have their cornea reshaped, resulting in clear vision without spectacles in the morning. 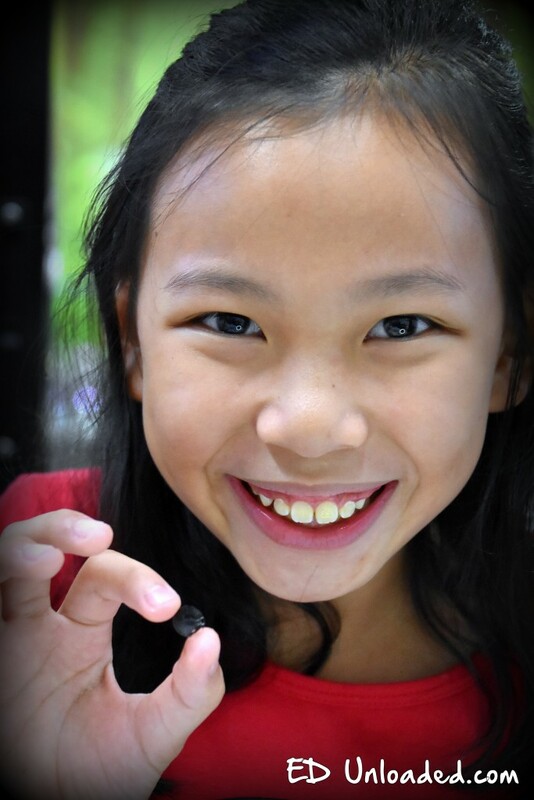 It sounds like just what our little girl needs, as it means that her myopia will not get any worse, and we can stop her myopia from worsening for the rest of her life! As parents who have perfect eye-sight, both Daddy and Mummy have never needed to wear spectacles. Therefore, when we were presented with Ortho-K, we were a bit apprehensive. Reading some articles online, we heard that there was a possibility of scaring and eye infections, if the procedure was not done properly. We therefore booked an appointment with AeroV to understand the whole process better! Talking to the friendly folks from AeroV, we found out that Orthokertalogy or Ortho-K was invented in the 1960s, and it has been in the market for some time. Through the years, Ortho-K has proven to be a reliable tool for myopia control. Although we have never worn contact lenses before, Brian from AeroV was patient to bring us through the whole process, and elaborate on how it works. First off, we asked about the dangers of scaring and eye infections. Although there are risks, they are minimal. Just like wearing contact lenses, hands and lenses must be cleaned thoroughly. 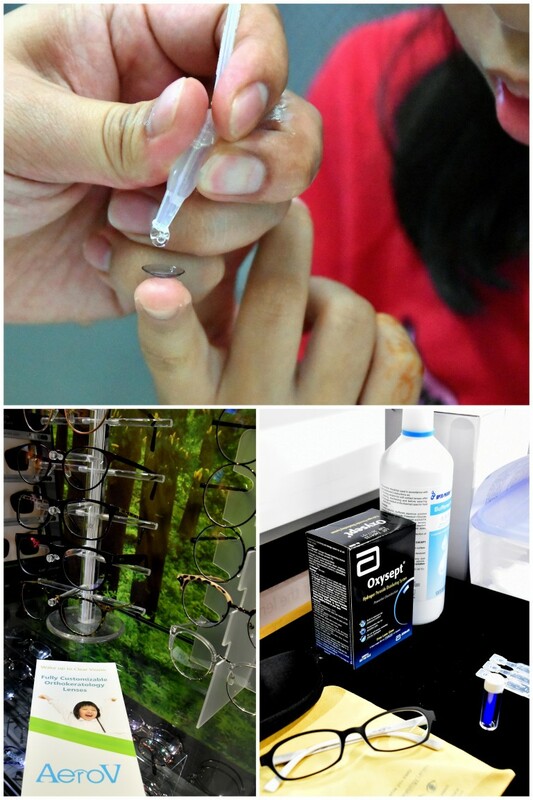 Eye infections occur, due to the lack of care taken in cleaning the lenses. At AeroV, the Ortho-K lenses are customized for each individual cornea. Hence, the risks involved with Ortho-K are also reduced significantly. This is in contrast to other generic Ortho-K lenses in the market, which offers lenses that are mass produced. After having our worries looked into, we started off on the process! 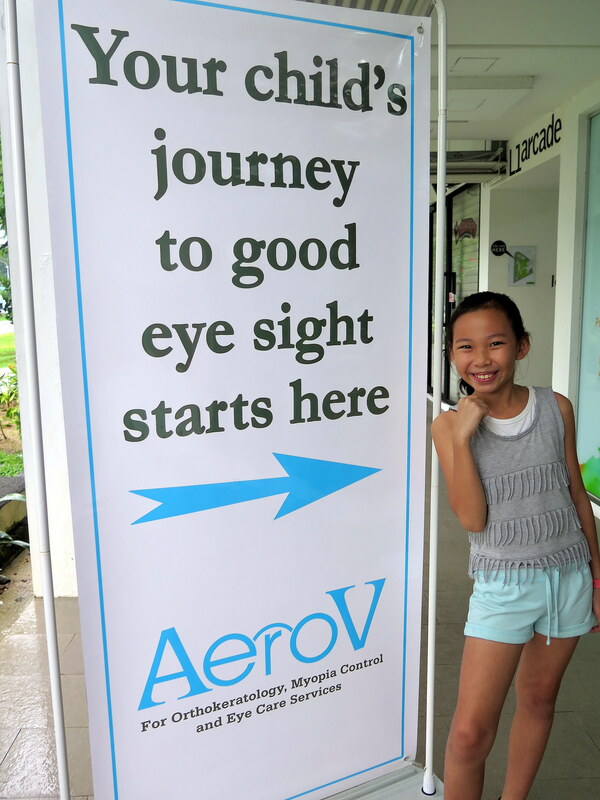 Nicole’s eyes had first to be measured, and the folks from AeroV, will then customize her own set of Ortho-K lens. We therefore only had our first fitting one week later. As our family has not worn contact lenses or any form of optical devices, we had to be taught how to put on the lenses. The process of putting on contact lenses can be quite scary for little children, as you need to place the Ortho-K lens into your eyes. Naturally, this takes practice and time. Nicole needed to put on the lenses at night, sleep for at least 6-8 hours with the lenses, and take them off in the morning. For the first 2 weeks, she needed to wear spectacles with half her normal degree, as it takes time for the cornea to be corrected and reshaped. 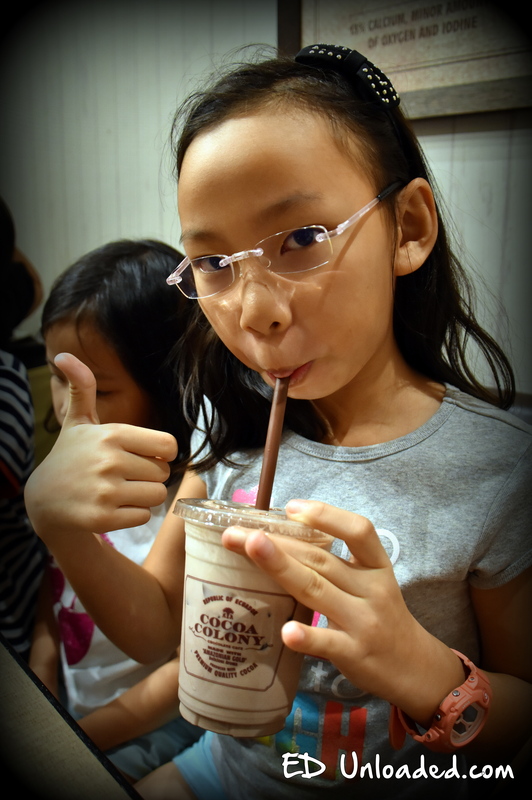 From our own experience, she was only ready to see clearly without glasses only after the 2nd week of Ortho-k. The Progress for every child varies, and depends on the response of the cornea to the Ortho-K lenses. For those who prefer scientific reports, here are her lab test reports. Her cornea was shapeless and myopic when we first started on 6 December. However, by 27 Dec, due to Ortho-K, her naked Cornea was reshaped, and those clear circular orange and blue pools, demonstrate healthy eyesight. Any other issues to highlight? My daughter had no problems learning to put on the lenses at the clinic. However, for the 1st few nights and days, she struggled putting on the lens. Initially she needed half an hour, to put on both the lens, and there were lots of tears due to the impatience and anxiety of putting on the lens. But by the 3rd day, the process became faster, and now she claims to be a ninja expert, during it swiftly!  Therefore, parents must bear that in mind, especially when there is a school bus to catch in the early mornings. How does Nicole find Ortho-K? She loves it! She enjoys her life without spectacles, and she is more than happy to go through the night and morning ritual of putting on and taking off the lenses. In time, she will be able to skip nights, as the cornea gets used to the new shape. And the most important question is of course,… How much does the process cost? Ortho-K will cost about approximately $2000, with costs varying due to a person’s myopia. The initial initial start-up will include the cleaning kit, as well as the follow-up consultations, to ensure that the fitting is good. Lens will need to be changed every 1.5-2 years, and the recurring cost will be $1000. There are other Ortho-K lens around but only a few of them offering customizable Ortho-K lens. Standard Ortho-K lens can only work optimally for up to a certain degree, but customized lens for Ortho-K has the added advantage in that it can also correct short-sightedness (up to 1200 degrees), long-sightedness (up to 400 degrees) and astigmatism (up to 600 degrees). Ortho-K works for both adults and children! We heard that Brian fitted lens for a 4 year old boy recently! If you are keen to find our more about Ortho-K for yourselves, you can book an appointment with AeroV , and I am sure that Brian will be glad to assist you. Address: Thomson V Two, 11 Sin Ming Road, #01-15/16/17, Singapore 575629.